Having some fun over here at BTFL (whilst on a break from studying for NBDE Part 1 Boards Examination) channeling my inner Spice Girls in order to bring you today's post. 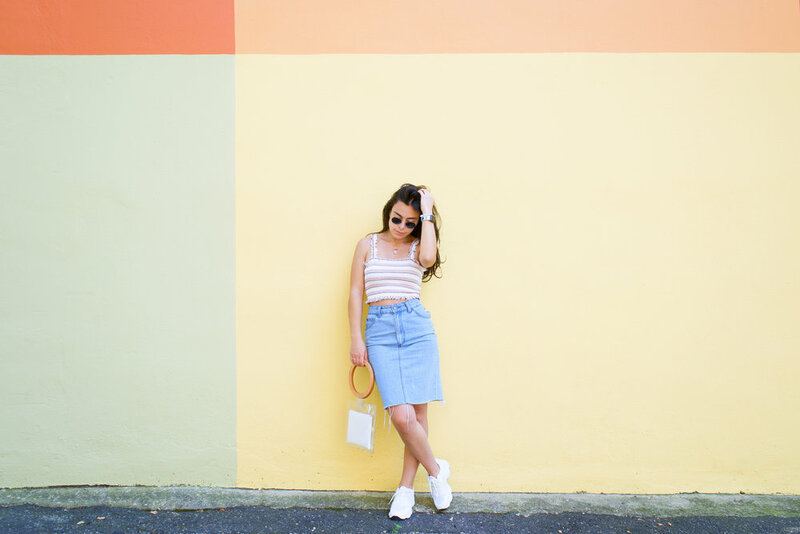 With some help from my friends over at Emmer and Oat and EGO Shoes, I was able to take one old denim skirt and style it two very different ways -- 1) the sporty look, as Sporty Spice would have it and 2) the girlie look, as Baby Spice would style it. Truth be told, growing up I was the biggest Spice Girls fan out there. I had the Spice Girls Barbie Dolls, I collected Spice Girl lollipop rappers, and of course I watched the Spice World movie upwards of 20 times. My two favorites were always Sporty and Baby so it should come as no surprise that I've identified with them while styling today's ensembles. One would think that styling a skirt (especially a denim one) in a "sporty" yet trendy manner would be somewhat impossible. Well now days, with all the sneaker trends going on, I found it quite simple using these chunky Kim sneakers from EGO, featured above. By the way these, on-trend kicks are only $28 right now! Obviously, Sporty Spice was almost always in athletic gear, but at the same time she liked to show off a little midriff using a cropped top or sports bra. 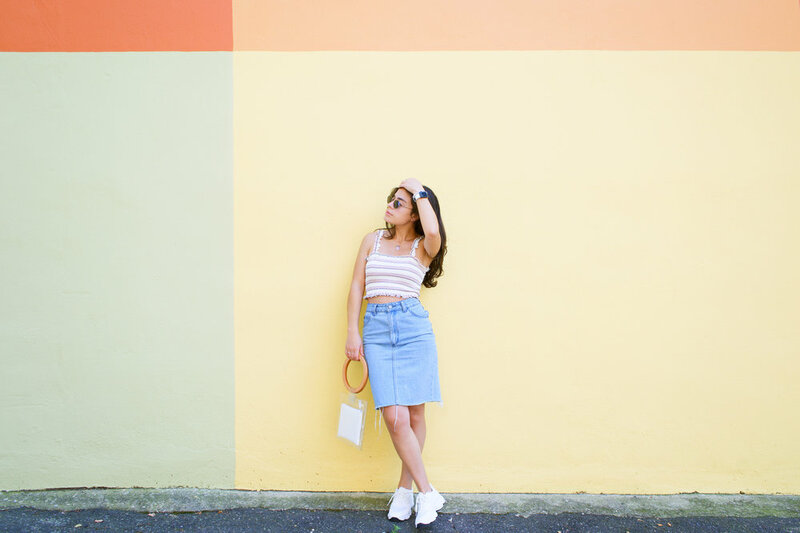 I've mirrored a similar, albeit less sporty, look using this adorable Ruffle Crop Top, from Emmer and Oat. This scrunchy top trend is a huge throw back to the late 90's (A.K.A. the Spice Girl era) and I'm loving it! Short skirts, platform shoes, pastel hues. Baby Spice was by far the girliest of all the Spice Girls! And if she were to style a skirt today, I could definitely see her using this top and these chunky sandals. This Rose and White Ruffle Top, also from Emmer and Oat, is such a sweet little number with lots of girlie detailing like it's pink hue and ruffle straps! And can't you just see Baby wearing these Rebel Chunky Sandal, from EGO?! Platform/chunky shoes have been a very popular lately and I'm more than okay with it. Maybe it's because they help add some height to my short stature? If you're on the lookout for some unique and quality-made apparel, I highly suggest you check out the rest of the Emmer and Oat collection. And as for footwear, EGO, which is one of my go-to places to shop for shoes, is offering 50% off select styles right now!